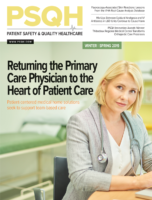 According to the survey, the 2018 State of the Nurse Practitioner Profession, almost 70% of respondents hold a certification in family care, 12% hold a certification in adult care, and six percent hold a certification in adult-gerontology care. Only four percent of respondents have a certification in pediatrics. Despite clear guidelines saying providers should screen for depression and provide follow-up and treatment, it’s the fourth least-reported measure on the Medicaid Adult Core Set. And only seven states report depression screening and follow-up data. The free webinar, Advancing Patient Safety Beyond the Hospital, is scheduled for Wednesday, March 13 at 2 p.m. Eastern. Radonda Vaught administered a fatal dose of the wrong medication to a 75-year-old woman in late 2017, after overriding system safeguards, as The Tennessean’s Brett Kelman reported, citing an investigation report by the Centers for Medicare & Medicaid Services.